Extraction services for broken or stuck keys. 24 hours auto locksmith emergences. 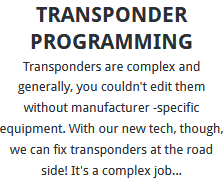 Advanced car transponder key programming. Lost and stolen vehicle keys services. In any of the above services and many more concerning your vehicle keys, our technicians have the expertise and experience to help you at the time of need. Worries aside, we are confident that any locksmith issue can be resolved, but with the right expert and the correct tools. Our call out service vans have all auto locksmith tools and our technicians have been training on proper use of each tool to ensure that the right solution is delivered in time and without any damage the car or physical injury. Auto locksmith issues can occur anywhere and anytime. If not attended immediately, you may have to cancel an important appointment or get late when going home, office or to any other destination. Even in a worse situation, you may miss a flight to a dream holiday trip only because your car key broke in the ignition. Time is very critical when it comes to solving any locksmith car key crisis. One of our business goals is to provide high quality locksmith solutions to motorists in the shortest time possible to save you from stress and more expenses. Our technicians are already in the field strategically positioned all over the Brighton area and with just a phone call, they will be right there with you to help you. We treat each case with urgency, and even when you just need an extra vehicle key for spare or for an extra member of the family, we are able to respond immediately and make the key for you. We are confident of our locksmiths, who are highly experienced and qualified to deliver quick services. In less than 45 minutes, you will be back on road to your destination. Call now and we won’t waste any minute on our way or on ground. There are many car manufacturers scattered all over the world – mostly known in Europe, Asia, India and Australia. With these we have all brands of vehicle on road today including; Subaru, Kia, Mini, Saab, Skoda, Nissan, Audi, BMW, Jaguar, Porsche, Jeep and many others. Out of taste, preference and other factors, car owners have a wide pool full of options to choose from. Different car makers use different mechanisms and technology when building car keys, hence different vehicles have specific key types. It only takes the hand of a professional locksmith with specialized knowledge and skills to handle your particular keys. At Car Locksmith Brighton, we have the expertise and knowledge concerning any vehicle keys and we are always ready to help in time of need. Whether you want a broken key extracted and replaced, duplicate spare keys, advanced transponder chip programming or any other auto locksmith need, we are prepared and ready to deliver timely and cheap solutions that solves the issue once and for all. We provide dependable any vehicle locksmith services in the following regions within the Brighton area; Burgess Hill, Portslade, Worthing, Newhaven and Shoreham by sea. We respond in less than 20 minutes in all of these areas and our quality and price are unmatched. Our drivers are familiar with all the routes in Brighton and will be able to find you within minutes. Call us and let us know where you are; in the office, at home or by the road. Transponder Key Programming – We have the equipment and software required for programming any type of car transponder chip keys. 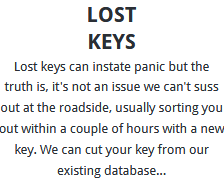 Lost Keys Replacement – If you have lost you keys or the keys have been stolen, we will make you a new key from the best materials and program in case your car uses a transponder programming. 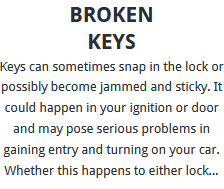 Broken Keys – Our technicians start by getting any broken key piece broken and stuck in the key holes from any of the car locks including the ignition. 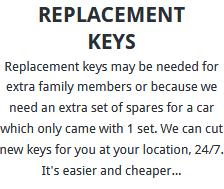 Spare Replacement Keys – No matter your car key type, we can make an extra key for spare. It is always a good idea to have a backup key to your car in preparedness for any emergency situation. Our technicians are ready and able to make any duplicate key including regular metallic keys and transponder key unique to your car. We treat all our clients with care, since we believe they are our most valued assets. We have trained all our staff on customer care practices and they are always polite and friendly whenever they are serving you. Having been in the business for more than 5 years, we have gained enough experience in all locksmith services and we deliver exceptional solutions to ensure that our customers are fully satisfied.Call us today and your queries will be answered patiently and accurately. We also give free professional consultation on call or at site. All Rights Reserved © 2018 Auto Locksmith Brighton.